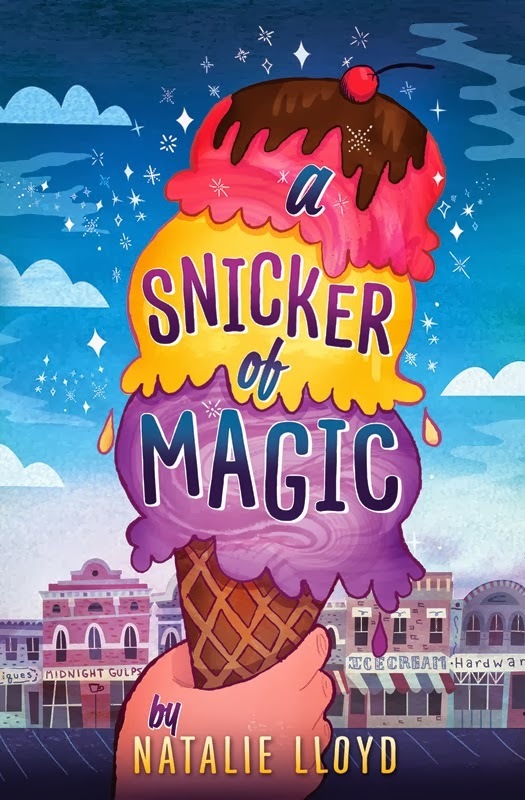 I accepted A Snicker of Magic for review because I liked the title but not so much the cover art. I started reading it with the assumption that it's one of many books which should not have been published, but that might exist just to fill a quota. I entered into the story with a purpose to skim and see. but was quickly sucked into the story. The snicker of magic which is running through these pages beckoned me in and kept me there. This book clearly had to be published precisely because it is magic. I ceased skimming within the first chapter and loved the read all the way to the end (although I'm still not a fan of the cover art). A Snicker of Magic is Natalie Lloyd's first novel and if she ever writes another I will read it. This book tells the story of a middle-school aged girl named Felicity (a name I happen to love but that you don't hear very often). Felicity's mother has "a wandering heart" and can't seem to stay in one place for very long. In the opening pages we discover Felicity and her sister being taken to stay at the home of their mother's sister, Cleo. Their stay at Cleo's is meant to be brief because, of course, they never stay in any one location long enough to establish roots. The town in which Cleo lives is called Midnight Gulch. Midnight Gulch used to be a magical place boasting residents with magical abilities. However, a feud drove the magic out of the town essentially destroying it. Felicity arrives in Midnight Gulch to discover that she feels more at home here than any other place she has ever been. What is the mystery surrounding the town? How does it effect her family's living habits? Well, you'll have to read the book to find out. I positively loved the character of Felicity. She has a habit of collecting words. She, and each member of her family, each have some form of synesthesia. Felicity sees words floating through the air and she collects them, learning to string them together to tell stories or write poems. Her sister hears music when she experiences different things. Her uncle sees colors when he plays music. Their family is full of interesting talent. Or, is it that a snicker of magic runs through each of their veins? Lloyd's writing style is so appealing to me. She writes her narrative in a poetic fashion. She is telling us a story, yes, but her use of words and phrases speak truth on every page. I marked several passages that I wanted to remember. "That's the spirit!" Miss Lawson clapped. And then she titled her head and looked down at me, at the blue book on my desk. "Maybe some of you write poems, or stories. you are welcome to share those too. Your words are pure magic, after all. Your words are necessary enchantments." I can very often tell how much a person loves another person by the way they say their name. I think that's one of the best feelings in the world, when you know your name is safe in another person's mouth. Firstly, most importantly, they were family. And if they had it to do over, I don't think they would have abandoned each other out here on the hillside. I think they would have said, 'Sorry for what I did to you.' And 'I choose to remember the good.' And they would have said, 'I love you.' Maybe if you say those words, maybe if you believe them, no curse in the wold has any power over you. This is a book about magic, yes. It is also a book about family, forgiveness, and belonging - three things which help to make each of our lives so very, well, magical. The story is told in a very interesting manner, with facts unfolding as you read along. It's a fun book to guess your way through as you try to connect the dots between characters. As it is a middle grade work of fiction, it feels compelled to add in a boy/girl relationship. Felicity makes friend of a young kid named Jonah and they have a rather close friendship that is strictly platonic. It's not until about three-fourths of the way through the book that Felicity's mother asks her if she has a crush on Jonah (which Felicity does not). If that one scene had been excluded from the book I would have handed the book over to my seven year old to read. However, I don't want to even pose the question of crushes and boy/girl relationships to him at this stage of the game. I'll hold this one back for a couple more years but I've no doubt he'll enjoy the read once he gets around to it. Although this is a middle grade book, I don't think that excludes it from being enjoyed by adults as well. (At least, I hope not, for I very much enjoyed it!) It was a delightful work of fiction that entertained me greatly. So glad to have been given an opportunity to give this one a go! Many thanks to Scholastic who sent this title my direction in order to facilitate the review. I received no additional compensation and all opinions are my own. This definitely sounds like an interesting read. I just might have to see if I can get it from my library myself. This sounds like something Duchess would enjoy. More to add to the TBR list.